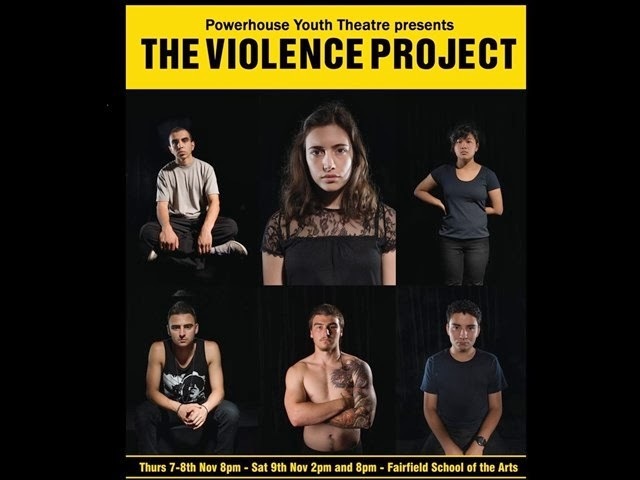 Powerhouse Youth Theatre (PYT) presents THE VIOLENCE PROJECT at Fairfield School of Arts, Harris Street, Fairfield. "Forty nine different voices from dozens of different countries, many in languages other than English, have come together for this project. These are stories from young people from Western Sydney, their response to violence, how they perceive it and live with it, and how their experiences are unique." This work does not depict violent acts but is reflective in attempting to explain the reasons for it. It attempts to tell us Why it happens, not to demonstrate What shapes it takes. What is interesting is the point of view that these collected voices give us. The naive presumption that one Australian life is much like another is exploded here, but with not violence, but with startling revelations of personal histories from the recent past and in the aching present, that explains some of the anger, violence about us. The post traumatic stress of dangerous living in other countries, the dreadful burden of daily living in a home of daily and relentless anxiety, and the forlorn hope of a future without that weight of dread, is sadly unburdened for us. The traumas of war, migration, racism and social isolation are revealed to us, gently, but with urgent appeal for understanding, rather than for hasty judgement. Six young artists, Justin Kilic, Angela Tran, Amanda Sullo, David Roberts, Adham Al Msoodny and Joseph Carbone under the direction of Johnny Leahy, Dramaturgy by Donna Abella (and Andy Ko), and Choreography by Linda Luke (using the Parkour skills of two of the participants to mesmerising affect), aided with video media film images, capture with simple an honest performances, the audience, with a gentle and vulnerable immediacy. Unsophisticated, sure, but rendered with a deep sense of integrity and responsibility. 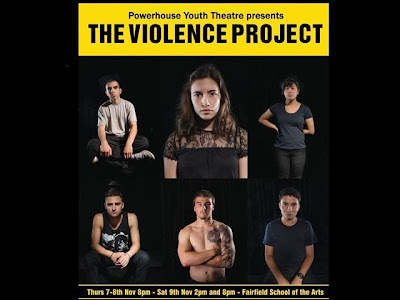 "The source material for this show was created through a series of workshops with young people from Western Sydney, with a significant portion of these young participants being newly arrived refugees. The workshops were run by Sweatshop - Western Sydney Literacy Movement, with the assistance of the NSW Service for the Treatment and Rehabilitation of Torture and Trauma Survivors [STARTTS]..."
This form of Community Theatre is staggering in its influence and revelation - a kind of community talking cure. I attended with a young aspirant actor from the local area, I am working with. She was moved and impressed. Excited and eager to know how to participate. THE VIOLENCE PROJECT was her first theatre experience, ever. It will be not her last. Congratulations to PYT and its organisers, Karen Therese, Johanna Allen & Nathan Luff. It highlights the importance of the performing arts as a persuasive instrument to implement change through shared conversation. Thanks for seeing the show. I'm glad you found it enjoyable! Just a minor thing - my name is actually Angela Tran, not Amanda! Is that possible to amend?